Having established the spacecraft in its initial trajectory around the Moon, FIDO could begin working on his next move: a short burn by the SPS that would be carried out after they had completed two orbits, about 4 hours later, in order to get Apollo into a closer orbit. This burn would be very carefully monitored to ensure that it had exactly the required effect. The details of this burn depended on the flight in question. For Apollos 8 to 12, a relatively short burn, known as LOI-2, brought the apolune down to 110 kilometres and made the orbit circular. Apollo 8, lacking a lunar module, required only a 9-second burn to achieve this. On the next three flights, the extra 16 tonnes or more of the LM meant that their burns had to be somewhat longer. On Apollo 10 the lunar module lacked a full propellant load and the LOI-2 burn was 14 seconds, but the full LM tanks on the next two flights extended the burn to 17 seconds. On these early flights, the CSM never left its 110-kilometre circular orbit, and the LM had to do all the work of getting down to the surface, starting with the descent orbit insertion (DOI) burn. After Apollo 12 the strategy changed, and instead of the CSM making the LOI-2 burn, it performed the DOI burn. The descent orbit was so called for the reason that it made the spacecraft descend to a near-side perilune of only 17 kilometres, which was the height at which the LM would begin its final descent to the surface. Planners were keen to increase the capability of the Apollo system, and analysis had shown that a LM's payload capacity to the lunar surface would be maximised by having the CSM do the work of taking it to the descent orbit, saving propellant for the final descent. Later, once the LM was released and inspected, the CSM would make a third burn to circularise its orbit at 110 kilometres, ready to undertake the programme of lunar reconnaissance that it would carry out while the LM was on the surface. This also placed the CSM in a suitable orbit for the rendezvous when the LM returned. Owing to its unforeseen circumstances, Apollo 13 never got as far as carrying out this burn. 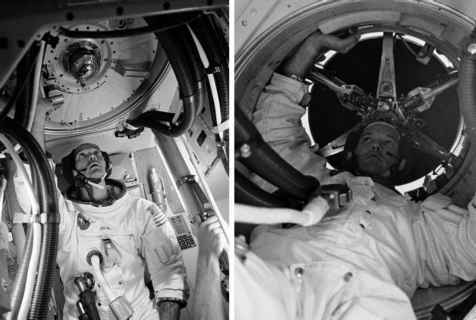 On Apollo 14, which was first to perform this manoeuvre, the burn took 21 seconds, which was 4 seconds longer than Apollo 12's LOI-2 burn, reflecting the fact that the near-side altitude was being dropped all the way down to 17 kilometres. As the mass of the stack increased for the final three J-missions, the duration of the DOI burn rose to 24 seconds.